Walsh and Piccard in their sub, on the way to Mariana. Have you ever been to the Mariana Trench? 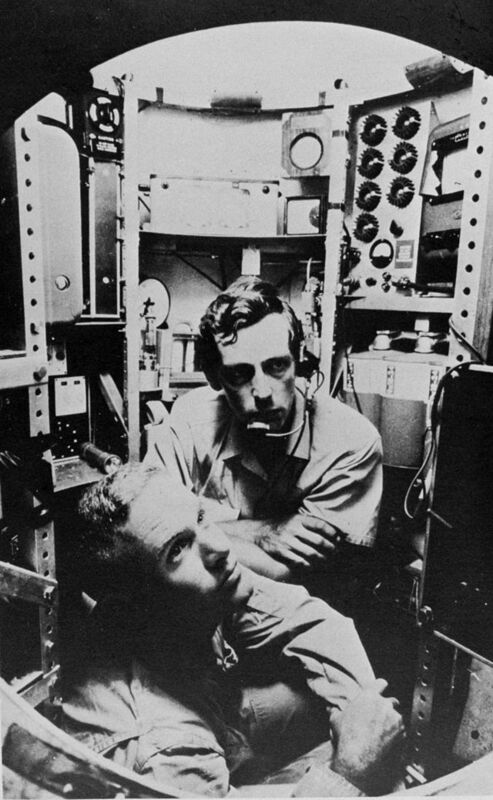 If you have, you are either oceanographer Don Walsh or film director James Cameron, because the only other person to ever have visited the trench (Jacques Piccard) died in 2008. Hello Don or James! Thanks for reading The Finch and Pea. If you’re one of the seven billion other people who haven’t yet visited, here’s a bit of travel info: The Mariana Trench is the deepest part of any of the oceans on Earth. It’s located in the Pacific Ocean, between Japan and Papua New Guinea. The trench forms the boundary between two tectonic plates: the Pacific plate in the East and the small Mariana plate in the West. 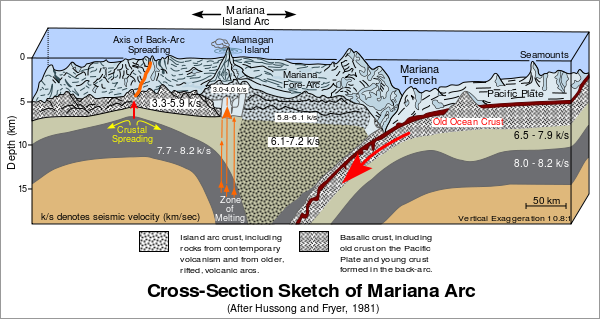 The Mariana plate pushed over the Pacific plate, which created the trench at the border. Above the surface, the tectonic plate boundary forms a series of small islands, the Mariana Islands. The island of Guam, just South of the Mariana Islands, is also part of this system. The Mariana Trench was first discovered in 1875, as part of the Challenger expedition. The deepest part of it was determined in 1931, by Challenger II, and is called Challenger Deep. I see a trend here. Challenger Deep lies almost 11km under sea level. That’s about 7 miles, for the non-metric among you. To visit it is indeed a challenge, which is why so few people have done so. Don Walsh and Jacques Piccard were the first to visit, in January 1960. They spotted a number of interesting species, and claimed to have even seen a flatfish, but more recent recordings (both by Cameron and unmanned dives) haven’t found any vertebrates at this depth. The second manned dive into Challenger Deep was James Cameron’s, in 2012. I must admit that at the time, just from reading headlines, I thought there were two* James Camerons: one who made movies and one who explored oceans. But no, it’s the same guy! During his dive, he recorded a lot of video footage, both for scientific and entertainment purposes. From the recorded footage researcher Natalya Gallo has already been able to identify several new species. There is probably a lot more to discover down there. Who will be next to visit and find out? *There are probably more than two. But there is only one famous one. This entry was posted in Have Science Will Travel and tagged Challenger, Challenger Deep, Challenger II, Don Walsh, Jacques Piccard, James Cameron, Mariana Trench. Bookmark the permalink.